In April 1999, I signed up to work on iFriends as an independent subcontractor. I created the name “amanda36c”. Four years later, in 2003, I purchased amanda36c.com. IFriends had no problem with that then. In 2008, iFriends purchased amanda36c.net and every year afterward, renewed it for one year. I left iFriends over a revenue dispute in late 2009. They should have stopped renewing amanda36c.net then or paid me what is owed from the monies they collected from my ‘fan club’ and content they were obviously still selling. They never paid me after that point and in February 2014, as usual, renewed amanda36c.net again. Good until 2015. On May 19 2014, however, they made a change and decided to renew it until 2023 instead. 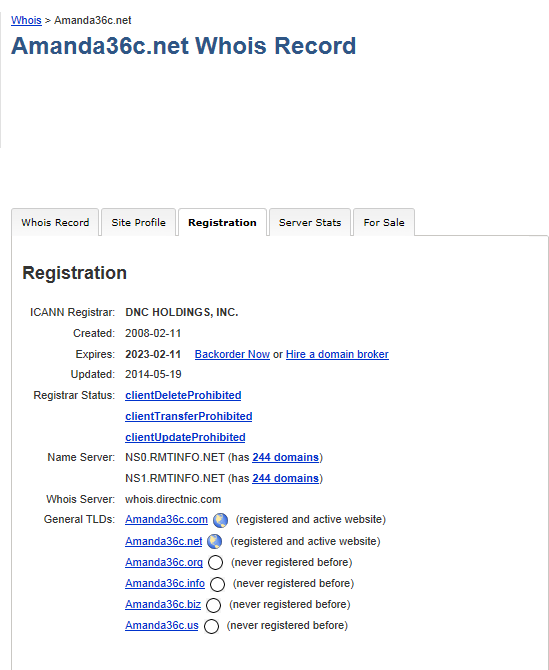 The screenshot below was taken from this page http://whois.domaintools.com/amanda36c.net on June 4, 2014. Their own site, iFriends.net is only renewed until 2017. Under their own contract, I was to be paid 50% for my ‘services’ and the sale of my content on their platform. Is it not obvious that my content is still being sold? No company would renew the dot net of a name for so long unless there is business being done under that dot net. If there is business being done, there is money being made. It isn’t exactly rocket science. So, where’s my 50% from all the sales of my content, iFriends? Shall we call it ‘coincidence’ that this recent renewal change comes just 6 days after the opposition to the trademark (amanda36c) was made public? After someone tried to acquire my trademark using the name Catherine St Louis, which is really Catherine Tayler, who later changed the name over to her ex’s, Clint Bialkoski. I am not under the belief that there are different people attacking me for my trademark and dot net, all at the same time. The timing and sabotage is all coming from one place. I have been doing business under the name Amanda36c for 17 years in total and now, iFriends wants to steal everything I have ever done with it and everything I have ever done business with under with that name. I know you read my blog (quite frequently, I might add, iFriends, Webpower Inc., WP Associates, WPI or whoever you call yourselves today). Your deep pockets have allowed you to get away with this for many years, kept all the litigators at bay and silenced many girls, but I am not them and I will fight you with everything I’ve got. Bank on it.